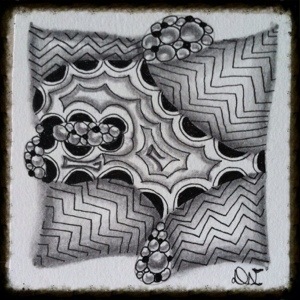 I was so excited when I turned to day nine in my “One Zentangle A Day” book. 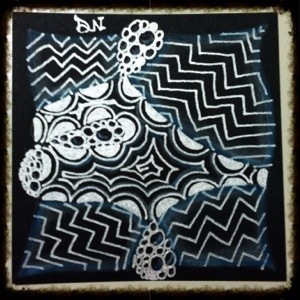 Day nine brought something I haven’t done before; working with a white pen on a black tile! This day’s challenge required me to do a little shopping. First , the black tile. Acquiring black tiles that were readily available was out of the question, so I headed down to our local Paper Source (a store totally dedicated to all things paper and then some) to purchase precut black card stock. While I was there, I was able to play around with an assortment of open stock white pens. I settled on Sanford’s Uni-Ball Gel Pen in a white silver color. This pen totally popped off the page! Armed with my new supplies, I got down to the task of creating my new tile. With a little inspiration supplied directly from the book, I decided to re-create “Day One, Creation One” tile. Choosing to re-create the tile allowed me the chance to directly compare the original to the new white-on-black tile. The recreated tiled used the same tangles from day one: Tipple, Static, and Crescent Moon. This tile ended up being a lot of fun to make since I had to think about creating this one a little differently. For shading I used a white pastel pencil with a hint of dark blue for contrast. I posted both tiles so you can see the difference between the two. Let me know what you think? And as always, I hope you “like” this post.